Having interviewed Mike, Super Micky Conroy, back in 2015, we thought it’d be nice to resurrect this one, for any new members, or Fulham FC fans, that didn’t get the chance to read it. Alternatively, you can have a read over at the Friends of Fulham Forum. Q) What was it like playing under 3 different managers between 1995 and 1998 and what were their differences? A) Playing under 3 different managers was not really much of an issue. Obviously once Mr. Branfoot moved upstairs within the club and Mickey Adams came in I think he started planning straight away for the following season. We managed to avoid the dreaded drop and once that was achieved he could concentrate on who he wanted and who he didn’t, I might have fallen into the latter. In fairness Mickey changed a lot of the training and also concentrated on fitness levels although Mr.Branfoot was big on fitness also. Mickey just went about it with maybe more updated training in regards to fitness work. he also had a different playing style which at the end of the day helped me in a round about way. To be honest I can’t say I spent a lot of time working with the new regime but small sided games seemed to be Kevin Keegans method. Q) How much of an effect did the boo-boys have on your confidence when you first joined us? How much of a boon or a hindrance can the supporters be when things are tough on the pitch? A) I am glad the boo boys issue was raised, something you don’t forget in a hurry. I believe at the football everyone is entitled to voice their opinions, it’s how that individual reacts to that sort of treatment. I was lucky that i was brought up with a never say die attitude and if things are not going the way you want them to, then you need to work harder and turn things around. My father gave me great advice as a youngster and even to this day. I can’t say it is nice but it comes and goes with the fact you are a professional footballer. Don’t get overly down when things are not going well but don’t get to carried away when the tables turn. What you put in you should generally get out. If you don’t put in you can’t expect anything out. Q) What was the change at the club like from a players perspective when Al Fayed took over? A) The change at the club was not dramatic but i think all playing staff and management new that it was only a matter of time. The club became so much bigger with two playing squads after Kevin and Ray came in. they started to bring players in that they wanted and the squad of 97 started to go elsewhere. Again that is the tough business of pro football. i suffered a foot injury at Millwall and that was more serious than thought and that was me finished as a Fulham player. Q) During his period at the club who did he think was the best player he played with? A) That is a very tough question to answer, all players played their part in gaining promotion and it’s hard to compare a m/f with a striker or a defender. You had international players like Chris Coleman and players of the caliber of Paul Bracewell all be it at the end of his career. We had Gleno who played top level with Southampton. Very hard to point to one individual. Q) Was it true Micky Adams got you to shed 2 stone, leading to your blinding performances for FFC? A) Another good question, after a difficult first season i spoke to Mickey and he told me he was making me available for transfer as he was looking to bring in some new faces and needed to sell first. I had no problems with that, the shedding of two stone was never brought up, i never felt i was a player who had issues with his weight. I am a non-drinker, non-smoker, non-gambler and so not the type of professional who over ate at any stage. I missed a lot of pre-season the year i joined Fulham as I was up and down to my family in Lancashire, I was out looking for property to rent when at times I should have been training. I had a new 5 month old baby we had to get settled quickly but not easy to do with London rental market. Certainly not an excuse but sometimes people don’t see the whole picture. In no way was there a mention of losing two stone. Q) That goal from the half way line against Wycombe… What the heck were you thinking about???? A) The goal from the halfway line…what can I say? Miss and hit the corner flag and I am in for some stick not only from the coaches but no doubt the fans. I remember it well. Glen passed me the ball just at the edge of the circle. The centre backs had backed off and allowed me to turn, I had a quick look, then another, and noticed the goalkeeper out off his line. if you don’t shoot you don’t score. Luckily for me the gamble paid off this time. One goal I am very proud of but would have been just as happy to tap in from 6 yards. There is no such thing as an easy or bad goal, not in my book. Q) What is your best memory of the promotion winning season? A) My best memory, happy to say I have lots of great memories during that time. Looking as far back as the game against Carlisle when we went head to head with what was thought the best team in the league, we won 1-0 in a very tough competitive game and I managed to get the goal. I remember the game against Cambridge when they were flying high and we hammered them 3-0 and I managed to get two. No complaining from me about not taking the penalty when Blakey made it three. Keep things right until the final whistle. Then we played Swansea, again they were riding the wave and we beat them 2-1 with Paul Brooker getting the second after the goalkeeper had parried my attempted lob. Obviously the day we won promotion is up there, up in a wet cold Carlisle. My mum and dad came down from Glasgow to see the game so was very pleased to get on the scoresheet and take part in another very good game of football and Rod’s winner was good enough to grace any game of football. Q) You were our leading goalscorer with 21 league goals in our promotion winning season in ’96-’97 from division three, was that your most memorable season of your career? A) It would be fair to say it was a very memorable season. I started the season on the transfer market and finished with a medal and the honor of being the first Fulham player to score 20 league goals in 20 years. Talk about football being a funny game. Certainly that season that started the ball rolling for Fulham would be a season to remember. However the Championship winning year with Burnley maybe just tops it. As I stated earlier, no Burnley player had scored 20 league goals in 26 years so to do that and actually win the league must just be the best a player can ever dream of. It is frustrating though that we had a better goal aggregate in 97 although Wigan had scored more we had a better goal difference. Q) Did you feel proud seeing Fulham in the Premier League and Europa League final? Did you feel part of the era which started all of that off? A) It was great to see Fulham reach the Europa Final and of course the Premier League, however the Fulham I joined and the Fulham of then I have to say was a totally different club. It will always be a lovely thought to know that you played a small part in the history of such a club but very difficult to compare as the club had went through so much change within that time. I will always be very proud though that I represented such a club and knowing I was the first player in 20 years to score 20 league goals. Many good memories. Q) Of all the teams you have played for, which one did you feel the closest affinity with, and why? A) As you are probably aware I had my fair share of clubs throughout my career. I enjoyed every minute of every day playing for all the clubs I represented. If I had to pick one then I think Burnley would get the nod. Moving from Reading to Burnley turned out to be a fantastic move for myself. Burnley went on to be Champions of the very last 4th division and I again managed to be the first player to score 20 league goals in 26 years. I also lived in Burnley which I suppose brings you closer to everyone as you are often seen walking down the shops or just getting petrol for your car. With London being such a big city even the big stars can walk about unnoticed. Burnley as a town revolves around the Football Club and in a big way reminded me of Glasgow. The passion and love they have for their club is total and living so close to that I would have to say my closest affinity came with playing with Burnley. I had made a lot of friends while there and would have probably lived in that area if I had not moved down under. Q) What was your most memorable goal in your whole playing career? A) Goals, goals, goals, I loved scoring goals. Whether it be a tap in or from the halfway line or a header I loved scoring goals. Having to pick a favorite or most memorable is very difficult. i scored a nice header for Clydebank playing against Rangers in the Scottish premier league 1986 just after Souness had taken over as coach. We beat them 2-1, the first time ever Clydebank had beaten them. Being a Celtic supporter might have something to do with that! My very first senior goal for Clydebank away to Kilmarnock, came on as sub with 15 minutes to go scored with three minutes to go, I got booked for celebrating with the 30 or so Clydebank supporters who came through to Ayrshire. Then we conceded with 30seconds left. The goal against Carlisle I feel was a very important goal as I think with that result we really took a lot of confidence going into the season. 1-0 Victory at the Cottage. then there was the equalizer in the 2-1 victory on promotion day. I am sorry i can’t really single one out. I loved them all and remember all. Q) You scored a memorable hat-trick in one hour in our 7-0 win against Swansea City (who were a division higher) in the FA Cup in 1995. Do you remember the goals? Nick Cusack was your provider for two of the goals that game, were there any other players in your career you developed an understanding with? A) If memory serves me well the goals came from Nick getting a flick on, then one came from the goalkeeper parrying and I got on the end of it with the third coming from a corner that Nick flicked on at the near post. Can always say I scored a hatrick in the F. A. Cup. While at Burnley myself and Roger Eli struck up a very good partnership with Roger getting 14 goals the season we won the league while I got 24. I think Nick and myself were a wee bit similar but Roger complemented me with his speed while I was stronger in the air. Q) When Al Fayed bought the club and had the money to buy players like Paul Moody, did you feel the writing was on the wall for you at Fulham, and did you feel you still had something to offer? A) Paul Moody was actually bought by Mickey Adams if my memory serves me well. I think all the players including Simon Morgan believed the writing was on the wall. 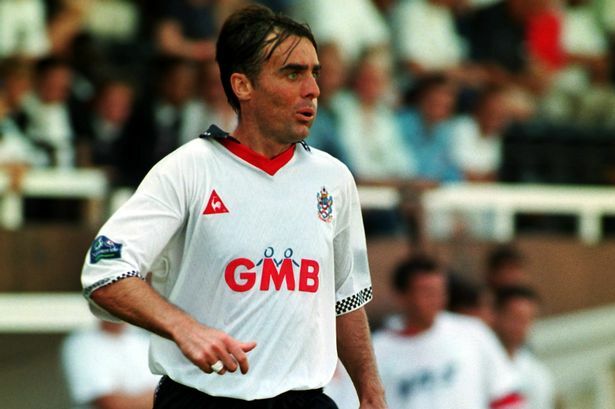 Morgs did very well to survive the cull and go on and get more success with Fulham, which in my mind could not have been more deserving to a great Fulham player who gave so much to the club. Did I have more to offer? i think goalscorers always have something to offer. Q) Do you still visit the Cottage regularly? A) I now live in Melbourne so don’t get a chance to see any live football. I really miss being involved. Q) What are you up to now? A) I am now involved with the Japanese sport brand Mizuno. We do running shoes which i do at least three times a week and we are Luke Donalds club of choice. We do fantastic running shoes and golf clubs. So get on board! If I could just sign off by saying that although my first season did not go down to well I still finished top goal scorer and that I always tried my best whenever selected to play. I have no issue with taking some stick as it’s part and parcel of being a footballer and especially if you are a striker. It comes with the territory. Overall I thoroughly enjoyed my time with Fulham and have many happy memories that outweigh the not so happy. i would like to thank everyone for their backing during the 97 season and I hope you enjoyed watching the team as much as we enjoyed playing as a team. I feel very blessed to have played my part in the ongoing story of Fulham Football Club.